OVERLAND PARK, Kansas – BLACKHAWK!, an industry leader in tactical products, will launch several new products to dealers at booth 14551 at the 2017 Shooting Hunting and Outdoor Trade (SHOT) Show in Las Vegas, January 17 to 20. The new BLACKHAWK! AR-15 No-latch Ambi Charging Handle is a drop-in upgrade to any AR-15. The handle is automatically held to the receiver with a leaf spring, eliminating the need to squeeze a small latch to charge the rifle. The innovative design gives full ambidexterious control, which is welcome news for left-handed shooters. The distinctive over-molded handle provides a larger pull point from both sides, easily clearing low-set optics. Pistol-grip shotguns are renowned for their ease of handling and manipulation, though running rounds through them can take a physical toll. The BLACKHAWK! Knoxx BreachersGrip Gen III mitigates the wear-and-tear with a patent-pending recoil reduction system that mitigates kickback from the heavy loads. The ergonomic design allows the user to comfortably control the shotgun in every scenario. 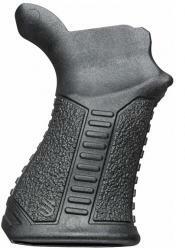 The new Knoxx AR Pistol Grip improves shooting accuracy and precision with the ability to manipulate the firearm. Offering premium comfort and stability for the AR platform, the improved grip angle and palm swell offer an intuitive fit, and the grip is further improved by the textured surface. two-tone mélange pattern helps to minimize imprinting of a weapon and a Teflon Shield+ coating repels stains, oil and water. Chest and sleeve pockets allow for everyday item storage. The new BLACKHAWK! Stretch Shield pant features mechanical stretch rip stop fabric and articulated knees, and delivers maximum movement and flexibility. Teflon Shield+ protective coating and quick-dry capabilities keep this pant clean and comfortable. Bartacks and rivets at the seams reinforce high stress points, and strategically placed pockets allow for secure accessory storage. Several new footwear items will also be available to dealers at SHOT. These items include two casual wear options, the Terrain Lo shoe and the Terrain mid boot. Both of these footwear options are ideal for both training and every day wear. Comfort and support are emphasized with these styles, which provide memory foam insole cushions and Agion antimicrobial lining to control odor. The BLACKHAWK! Defense, a military-grade boot that is AR 670-1 Compliant, includes a Vibram outsole for maximum traction and stability and an OrthoLite Insole to cushion the foot. The BLACKHAWK! Street is a versatile, comfortable boot with Lightweight 1000 Denier Padded Nylon to add reinforcement and extra stability. The Force boot features a HydroGuard + Breathe Right moisture wicking membrane that is both waterproof and breathable. The V3 boot’s quality construction starts from the ground up with a Vibram outsole and an OrthoLite Insole. The V3 goes on and off easily with the NATO Lace System. Plus there’s room to store small gear, such as a knife, in the Lycra Lateral Pocket.